Benjamin Franklin is credited with stating “an ounce of prevention is worth a pound of cure. “That saying could easily be applied to aircraft maintenance. We perform certain inspections in hopes of mitigating any problems before they give us any grief in flight. We might replace an accessory at some predetermined time that we believe will eliminate any chance of having that part fail in flight. Certainly replacing a part is an inexpensive prevention compared to the risk of an in flight failure or the cost of repairing the damage that might result. While changing parts is one way to avoid catastrophe, it is not a particularly efficient one and may, in fact, cause more problems than it avoids. A better approach is to inspect where necessary and monitor all indicators looking for evidence that some action should be taken. When action options are available, the least intrusive is usually the best. Suppose an oil analysis showed excessively high content of certain wear metals that indicated a camshaft was failing and was confirmed by visual inspection through the lifter bosses. After this terrible discovery, suppose we were presented with two options: 1) remove the engine from the aircraft, split the case halves, and replace the camshaft with a new one or, 2) just remove the lifters for access to the cam and make some sort of miraculous repair with the cam shaft still in situation. Option 2 seems the obvious choice. A second example might be a leaky exhaust valve. Let’s say a routine cylinder compression check revealed low compression on one cylinder. We put an ear to the exhaust tail pipe and can hear the air escaping and so determine the valve is leaking. To be very certain of our findings, we use a borescope or videoscope to take a look at the offending valve. Maybe the visual inspection shows no signs of burning or heat damage to the valve, and we only find debris on the valve seat which prevents a good seal. 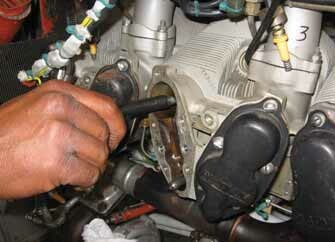 A typical course is to remove the cylinder and send it out to an engine shop for repair. Wouldn’t it be cool if we could just reach in that cylinder and clean off the valve and valve seat without removing the cylinder? … Oh wait,,, we can do that one! In the “old days” a new cylinder was very pricey, and sending a cylinder out for repair wasn’t much better. Many small airplane repair shops would have the needed equipment to do basic cylinder repairs in-house. This would include a valve grinding machine and a set of hones to “face” the valve seats. Replacement of valve guides is pretty easy and was often done in the field as well. I still do these repairs in-house from time to time and use the same equipment my Dad taught me to use forty years ago. A small but very important final detail of installing these parts is the lapping of the valve. The proper connection between the valve and its seat accomplishes many things. Of course, the exhaust and intake valve must seal well to allow good compression and combustion in the cylinder during engine operation. The valves must also make good contact with the seat to help transfer heat. Not a great picture but the post lapping shows good contact on the valve and seat, all the way around. The contact surface between the intake valve and its seat is fairly narrow, maybe a 1/16″. This is plenty to form a seal but doesn’t get rid of much of the heat generated during combustion. Fortunately for the intake valve, every time it opens, a mixture of cold gasoline and air wash over it. This not only keeps the intake valve cool but also clean. It is very rare to have any sort of problem with intake valves. The unfortunate exhaust valve lives a very different life. The exhaust valve endures the heat of the combustion when all those nasty, fiery, over heated, debris-laden gases go rushing over it on their way out of the engine. There are two main sources of valve cooling. One being the contact between the valve stem and the valve guide and second being the valves’ contact with the valve seat. To transfer the heat better, the contact surface area between the exhaust valve and seat is about double that of the intake seat. Even then, the time duration of the contact is very short, so solid and complete contact is very important. The debris escaping from the combustion chamber is a real problem when it is sandwiched between the exhaust valve and the seat. This debris can stick in place which prevents the valve from fully closing. Over a period of time, the gap created allows enough hot gases to escape during the combustion event that it can erode a trail in a spot on the valve or the seat. Over time, this spot endures far more heat than it can handle, and the valve “burns.” There are other causes of burned valves as well, but this happens to be one we can easily see and work to prevent. What we’d really like to do is clean the valve and seat before damage occurs. The low compressions often start showing around the 700 hour to 1100 hour range depending on how the engine is operated. If the valve could be properly cleaned, one might get another 500 hours or so of good engine operation before the problems reoccurs. Almost too late for this seat. You can see where erosion has begun. We’ll start with what some call the rope trick. It’s usually associated with performing the valve wobble check service bulletin on Lycoming engines, but the objective is the same: release the valve from its return springs so it can move freely. The spark plugs are removed and the crank shaft rotated to place the piston near the bottom of its stroke and advancing to the compression stroke. A length of rope is pushed into the combustion chamber through one of the spark plug holes to nearly fill the chamber. The crank shaft is then rotated to bring the piston toward the top of the cylinder which will hold the valve closed. With the valve held closed, the valve keepers can be removed followed by the valve springs. The pressure from the piston can be released and the rope removed. At this point the valve should be easy to rotate and move in and out by hand. If it won’t move easily, then we have another problem. A stiff valve implies sediment has built up in the guide reducing its diameter. The valve can be removed and the guide reamed to clean out the sediment. This problem must be addressed straight away, but is fodder for a separate article. Rocker arm removed, rope in place, piston applying back up pressure so the valve springs can be compressed for key removal. 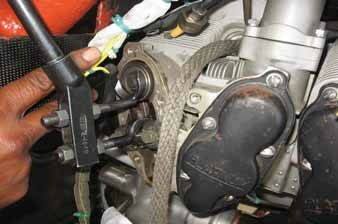 A section of rubber hose can be slipped over the end of the valve stem as a handle for the next operation. The valve is pushed into the cylinder far enough to apply a small amount of valve grinding compound through one of the spark plug holes. The valve is then pulled back until it contacts the seat. While holding pressure on the valve, it is rotated back and forth until the rough sound of the grinding begins to smooth. A cloth is snaked into the chamber to clean the compound from the mating surfaces of the valve and seat for inspection. A properly finished product will yield a dull but complete and even ring all the way around both parts. The width of this surface should be about 1/” wide. If there are still significant areas that didn’t get resurfaced, the grinding process can be repeated. Rubber hose on the valve stem to manipulate it for the lapping. There’s no hard fast rule as to how much grinding should be done. In a perfect world, the first try cleans off all the debris to reveal a perfect mating surface. In the real world where I live, there will be many small pits in the seat. A second more aggressive grinding effort would be made with another application of grinding compound. To speed up the process, the end of the rubber hose can be chucked into a slow turning drill. The valve and the seat are made of very hard materials so you don’t have to worry too much about overdoing this process. When making the initial 45 degree cuts on the seats and valves with the cylinder removed from the engine, large power tools with stone grinding wheels are used. A little grit between the parts is going to be a relatively slow process. Nevertheless, frequent visual inspections of the parts during the operation is recommended. After the final cleaning and inspection, a preliminary compression check can be done. Reinstall one of the spark plugs, apply compressed air with a standard differential compression tester, and hold the valve in the closed position. A significant improvement will be noted. We usually see 68/80 or higher. The other leakage is usually past the piston rings. Now the rope trick is repeated to hold the newly reconditioned valve in place while the springs and keepers are reinstalled. Next the rocker arm, push rod, and related parts are reinstalled, pretty much in the reverse order as removed. Once everything is in place, a final compression check can be perform just to see how good it is with all the parts together. There’s nothing magical or new about this procedure. For a lot of the younger mechanics or those not familiar with engine work, it is an unknown practice that they may be uncomfortable performing. It is far less intrusive than removing a cylinder, and gets the exact job done that is needed; no more, no less. The skill and experience is in knowing when to do this procedure. If performed too early, it’s just an extra unnecessary expense. If performed too late, it’s ineffective and a total waste of time. 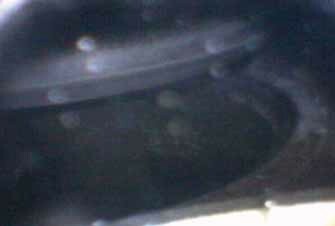 Borescope inspections of the exhaust valve mating surfaces every annual or at most 100 hour inspections is the best way to determine when a precautionary valve grinding is profitable. We feel it keeps one healthy, wealthy and wise to ensure the work is done while only an ounce of prevention is needed.